Fireworks are fun: They're loud, colorful against the night sky, and — let's face it — kind of thrilling to light up and watch. But they're also a lot of work and even avid pyrotechnics can hardly match the firepower of organizations like the Coeur d'Alene Chamber of Commerce, whose annual FIREWORKS OVER LAKE COEUR D'ALENE unites local families and businesses for a stunning fireworks show. Sponsored by the Coeur d'Alene Casino and Numerica Credit Union — and supported by donations from local businesses — the theme for this year's fireworks and parade is "America the Beautiful." 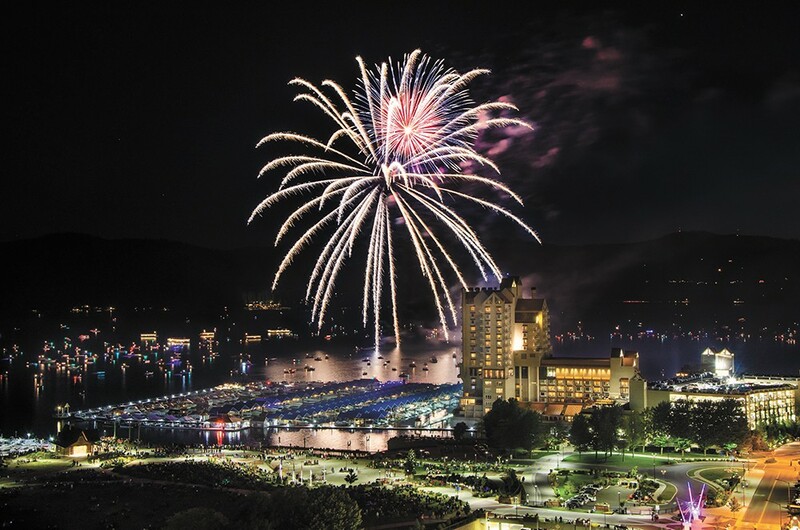 Fireworks start at dusk (around 9:45 pm) and can be viewed from throughout downtown Coeur d'Alene, although you can secure the best views from the comfort of your seat aboard a lake cruise or at any number of specialty venues. Enjoy Steaks and Sparklers, a buffet dinner starting at 6 pm, featuring live entertainment by Smash Hit Carnival under the big tent on the front lawn of the COEUR D'ALENE RESORT (adults $80, ages 3-12 $35, ages 2-and-under free; add an overnight stay package for two starting at $449). Do the same thing at a little bit higher level with the VIP Grand Dinner Celebration on the Resort's Lakeview Terrace (adults $99, ages 3-12 $45, ages 2-and-under free). Visit cdaresort.com/discover/activities/independence_day or call 855-703-4648. Another option is a LAKE CRUISE, getting you out on the water for an unparalleled view of the fireworks, the lake and the lights from town. Both the standard Fireworks Cruise (adults $35.25, ages 3-12 $31.25, ages 2-and-under free) and VIP Cruise, which includes appetizers and two beverages (adults 21-and-older-only, $61.25), depart from Independence Point and last about two hours. Visit cdaresort.com/discover/cruises/tickets. Fun-seekers needn't wait until nightfall to enjoy Independence Day in Coeur d'Alene, however. The annual FOURTH OF JULY PARADE is a traditional celebration of community for folks going back many generations, beginning at 10 am and running nearly the full length of Sherman Avenue. Here are some tips from insiders: Park in midtown and walk downtown or get there extra early, drop off your chairs and go enjoy a bite to eat or cup of coffee first. As the crowd disperses, grab a bite of lunch or walk over to City Park, which this year will host a family-friendly day of free music and entertainment from 10 am-7 pm, culminating in a performance by the very danceable group, Nu Jack City. For unforgettable family fun on the Fourth, take advantage of Independence Day specials at Triple Play. A late night pass (6-10 pm) is only $17.76 (see what they did with that?!) and includes all Triple Play attractions and the waterpark, plus a $5 game card and a Fourth of July prize. When four young singers are killed in a car crash, they posthumously take the stage for one final concert in this goofy, 1950's nostalgia trip. Tickets are $49 for adults; $42 seniors (ages 62+); Wed-Sat at 7:30 pm; Sun at 2 pm; Kroc Center. If you have the stamina, love golf and can't resist a good deal, then book yourself the longest day of golf package at the Coeur d'Alene Resort Golf Course, which features 36-holes of play and a barbecue between rounds. Break it down by rate per hole and it's the best value of the summer. Starting at $299 with resort accomodations. The original print version of this article was headlined "Explosive Fun"